Andreas Klein is widely admired as a pianist of rare sensitivity and musicality. The Washington Post has praised his "articulate and flowing pianism" while the New York Times called him "a pianist who makes silences sound like music." About a recent Glenn Gould tribute (with the Minguet String Quartet), the Calgary Herald reported, "(Klein brings) to his performance a mature understanding...as well as a brilliant execution", while Classical Voice of North Carolina (CVNC) was even more blunt: "Andreas Klein is a stupendous pianist...a stunning performance by any standard, and it brought the audience to its feet in a rousing ovation." He has performed in many of the leading houses of Europe, from Wigmore Hall in London to the Berlin Philharmonie, as well as Carnegie Hall in New York and the Kennedy Center in Washington DC, and is at home with the grandeur of playing with the Berlin Philharmonic or the vast reaches of the Ravinia Festival (where he received two standing ovations) as he is with the intimacy of Le Poisson Rouge (NYC). He has extensively toured North America, with ensembles including the Salzburg Chamber Soloists (a 20-city tour) and the Festival Strings of Lucerne (10 cities) and in South America, where he performed Beethoven's Piano Concerto No. 4 in Peru, Chile, Argentina, Colombia, and Brazil. Some exotic places on his concert tours included Damascus and Yerevan. In recent years Klein has added more forays into chamber music alongside his concerto and recital repertoire, including major projects with the Minetti Quartet and the Casals Quartet (Schumann's Piano Quintet - US tour and Casals Festival, Puerto Rico). These collaborations have taken him to important venues such as Philadelphia's Kimmel Center, Spivey Hall near Atlanta and the Wortham Center in Houston. A frequent broadcaster, Klein has often appeared on WGBH Boston, WFMT Chicago, APR in ST Paul and KUHF in Houston. He was the subject of a "Musician Portrait" in Germany and his "Intermezzo with Andreas Klein" was televised by PBS. His recordings, "Piano Sonatas" and his album of music by Beethoven and Berg, have won admiring reviews (he is also an admired recording producer). And his self-composed new cadenzas for Mozart piano concertos have also won widespread praise. "Whatever the composer, whatever the project," he says, "for me it is about being inside the music." "Pianist who makes silences sound like music"
"Seasoned Mozartean Andreas Klein, a refined and elegant pianist"
"Elaborate display of technical prowess. Klein resembled a sketch artist bringing a scene to life with quick virtuoso strokes and shading - Klein conveyed an impression of narrative momentum underlying a musical structure, regardless of how explicitly programmatic." "Klein is an Interpret above all modern, who gives detailed attention to the interpretation of the work and executes a clear picture of the structure of the piece. He accomplishes with immaculate technique a rare beauty of sound." SURPASSING MUSICALITY - "... played without unnaturalness, often somewhat fragile in tone, delicate, but with strong endings." "Andreas Klein, a pianist of the highest caliber, performed both Beethoven Sonatas in E major, opus 109, and in A major, opus 101, with dramatic expression, bravura, and a flawless technique: yet the slow and lyrical phrases were shaped with subtle sensitivity." A LISTENING INDULGENCE - "The interpretation of Schubert's Impromptu in B flat major belongs to one of the most beautiful pieces presented in this concert. Klein played ingeniously, each single note differentiated, vivid and in every regard intended." CONCERT OF AN EXTRA CLASS - "The virtuoso Klein, a pianist counted among the extraordinary class was able to set a new milestone into the history of the Mosel Festival. Klein's Beethoven was spot-on. In tender moments, such as the Andante, the pianist brought to the music great sensitivity and mystery, and where the score turns boisterous, such as his solo cadenza, Klein tapped reserves of power that seemed limitless." 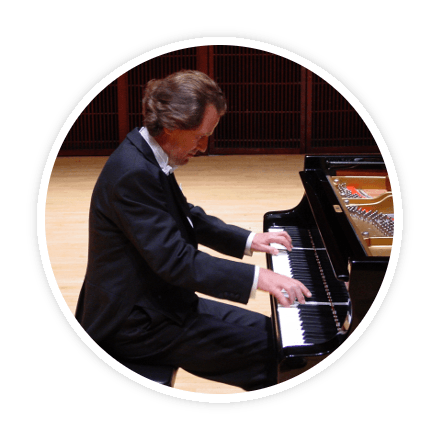 "Internationally renowned concert pianist Andreas Klein joined forces with the Stockton Symphony to tackle Beethoven's Piano Concerto No. 4. His precision and communication with conductor Peter Jaffe made this daunting work a thing of beauty and brilliance. The contrasting dialogue between piano and strings in the brief but moving second movement evoked conflict and sadness, which is soon eclipsed by the ecstatic rondo of the third movement. A bright, unmistakably Schubertian opening sets the tone for the piece. From Klein's first entry throughout the entire Liszt's Schubert Fantasie he played with articulate clarity while displaying expressive technique and craftsmanship. I was particularly taken with his voicing in the slow, second section, one of two solo passages that featured Klein. The ensemble between orchestra and soloist was excellent, providing an uninterrupted flow from beginning to end. Perhaps the most exciting moment was the return of the opening theme in the final section, scored in fugal imitation propelling the fantasy to its grandiose conclusion, where one could not help but hear Liszt's impact on the work." "Magnificent and impressive was Andreas Klein in Beethoven's 4th Piano Concerto. In his entire interpretation he gave back the composers torment between intellect and emotion and with the superb command of his technique, the loud passages were never aggressive, his tonal colors were limitless, his scales always sparkled. Most gripping and impressive was his huge dynamic range; his control to produce a flawless shading down to a barely audible sound was breathtaking." "Your performance was nothing short of spectacular. I still have people saying to me that they were blown away by the performance and the experience. And the sponsor was thrilled with performance and the reaction of the public." "Maestro Andreas Klein's impeccable execution, his excellent sense of voicing - a rare caliber of musician - It was only a pity to realize the absence, with few exceptions, of other pianists, musicians and artists, who would have been able to take advantage and enjoy the excellent performance of maestro Klein. The combination of skill and affection he showed as an interpreter was of a quality rare to find in a soloist. Thank you, maestro."